This chapter analyzes the current status of women in higher education and discusses key issues for enhancing gender equality at higher education institutes in South Korea. By analyzing statistical data and reviewing articles, books, and government documents, this chapter explores the following research questions: (1) what is the current status of women in higher education institutes? (2) what are main obstacles for achieving gender equality? (3) what are the contents and results of gender equality policies led by the government and higher education institutes? (4) what are key issues to enhance gender equality? 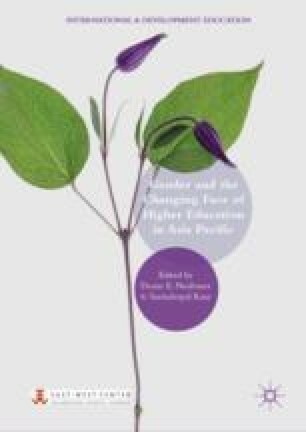 The contents discussed above are helpful to identify the real condition of women in college and to explore alternatives for achieving gender equality in Korean higher education institutes. Ministry of Education and Korean Educational Development Institute (MoE & KEDI). 2017. “Statistical Yearbook of Education (each year).” Ministry of Education and Korean Educational Development Institute. http://kess.kedi.re.kr/index. Accessed June 15, 2017.